On December 18, 2007, H.E. Mme. 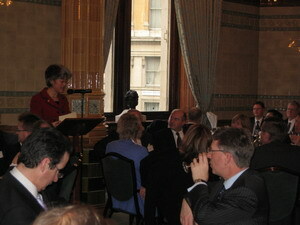 Ambassador Fu Ying attended New Year's luncheon held by China Association and delivered a speech on Sino-UK relationship. She denoted that China takes UK as an important partner. Sino-UK relationship is facing a new opportunity point. The upcoming visit to China by Prime Minister Gordon Brown will create more opportunities for Sino-UK cooperation. Fu Ying also introduced core messages from the 17th CPC Congress and the Central Economic Conference. She took questions from members of China Association. As to Hong Kong Special Administrative Region's situation, Fu Ying denoted that Hong Kong is successfully implementing "one country, two systems", "Hong Kong administrated by Hong Kong people" and its development is quite well. When Hong Kong was stricken by Asian financial crisis and SARS, the central government provided a powerful support so that Hong Kong maintained economic prosperity and social stability. China and UK have properly solved Hong Kong issue through negotiation and kept on communicating and coordinating concerning some specific affairs. As to RMB exchange rate and export rebates, Fu Ying denoted that reform of RMB exchange rate shall be adaptive with the pace of China's development and economic reconstructuring. Rapid appreciation of RMB is harmful to China's economy and world economy at large. The Chinese government is gradually adjusting its policy of export rebates, but export's contribution to national economy and the medium and small enterprises shall be taken into consideration. As to Sino-UK economic and trade cooperation, Fu Ying pointed out that China's economic growth is being transferred from relying mainly on investment and export to relying on consumption, investment and export. Import and outbound investment will be further strengthened in the future, which will help UK to expand its export of service and environmental protection technology and product to China and to attract Chinese investment. A lot of achievements have been made by the visit of six provinces's delegation from Central China in October 2007. In particular, Wuhan entered into an agreement with the UK side on environmental protection cooperation. Technology trade and environmental protection cooperation are becoming new highlights of Sino-UK cooperation. As to Sino-UK educational cooperation, Fu Ying denoted that at present, nearly 100,000 Chinese students are studying in UK. It is estimated that there will be an even larger number of Chinese students next year. Till now, there are totally 9 Confucius Institutes in UK which are playing a positive role to Chinese teaching. There is still room for Sino-UK education cooperation. Fu Ying's remarks drew ardent applause from 130 participants. Hugh Li Davies, Chairman of China Association, thanked Fu Ying for attending the luncheon. 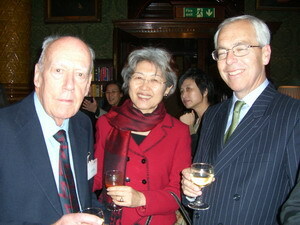 Sir Alan Donald, President of China Association and former British Ambassador to China, delivered an ardent speech. Sir Donald denoted that China's reform and opening up policy is successful and plays a key role in China's rapid development. China's access to WTO and the 17th CPC Congress has made Sino-UK economic and trade cooperation enter a new phase. It is believed that the comprehensive strategic partnership between China and UK will constantly go forward. China Association, UK was founded in 1887. It is an organization to promote Sino-UK economic and trade cooperation with the longest history. It has proactively advocated Sino-UK trade since the founding of the People's Republic of China and promoted the establishment of Sino-British Trade Council (SBTC), which later developed into China-Britain Business Council (CBBC). China Association merged with CBBC in 2003 but maintained its original name and operational mode.